These high quality Microweave Lanyards with NPS Swivel Hook are made from a tightly woven polyester material with a ribbed texture. They are 36 inches long and are 5/8" wide as opposed to many lanyards which are only 3/8". The extra width gives these lanyards a premium look and feel. Microweave lanyards are available in twelve different colors and with your choice of ten different attachments on the end. You can even choose between break-away and non break-away options. These Microweave Lanyards with NPS Swivel Hook offer a comfortable fit, professional look and all the options that you could possibly need for your ID's and badges. Product number 2136-3501. Welcome to MyBinding video. 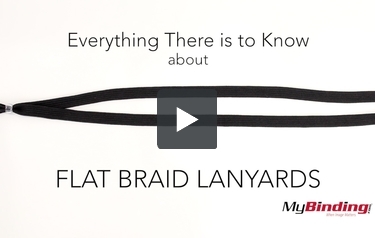 This is everything there is to know about Flat Braid Lanyards. Starting with the more obvious, these lanyards are flat and they?re braided but here?s a close look so you can see for yourself. You can personalize flat braid lanyards with a printing or silk screen of your logo, name or really whatever you want. Look for the breakaway straps for extra safety. Many of your attachments work especially well with name badges, ID cards, key cards, and keys. They include bulldog clips, hard clamps, plastic hooks, rings or swivel hooks. They are 36? in length and most have a 3/8? width as demoed here. Also check out microweave for a different variation in flat lanyard. And they come in many different colors. For more demos, reviews and how-to?s, go to MyBinding.com.